The mission of Abiding Word Lutheran School remains to make disciples for the Lord’s kingdom by providing a Christ-centered education that challenges and prepares students for lives of Christian service. At Abiding Word Lutheran School we educate the whole child: Soul, Mind and Body. Soul: Every day we teach children about Jesus, their one and only Savior from sin. In addition, God’s Word permeates its way into everything we do. From athletics to the way we talk about decision making, God’s Word is the guide for us at our school. Mind: Our teachers work very hard to provide an education that challenges our students and prepares them academically for each next step in their educational journey. Our students typically transition very well into high school. Body: We pride ourselves in an education that includes taking care of our bodies. Students are given ample opportunity to get physical exercise during the school day and are encouraged to consider their health in making decisions with their time and energy. All of our teachings are based on the bible. The Christian faith is not just taught in a religion class but is integrated in our students’ entire day. Christ is at our Core. Christ-centered: Jesus is at the center of all we do. Team Work: Our teams come first when making decisions; we work together as a unit. Abiding Word is part of the Wisconsin Evangelical Lutheran Synod (WELS) school system, the 4th largest private/parochial school system in the country. We are one of around 350 schools in a school system across the 50 states. WELS is rooted in a deep tradition of serving others. Our school seeks to share the Gospel of Jesus with students and their families all the while offering an excellent education that prepares students for high school and beyond. 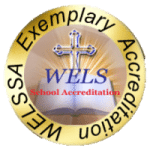 Our school has achieved exemplary accreditation from the Board of Directors of the Wisconsin Evangelical Lutheran Synod School Accreditation (WELSSA). Schools working toward accreditation must complete a comprehensive self-study, host a site visit team of educators outside the school every five years, and develop and implement a school improvement plan to maintain accreditation. The school files an annual report detailing their progress in meeting their goals and staying in compliance with the WELSSA standards. WELSSA is a member in good standing of the National Council on Private School Accreditation (NCPSA).